Following the success of “Kingsman: The Secret Service” (2014), director Matthew Vaughn immediately began writing a sequel. Unlike the first film, which was based on the comics “The Secret Service,” this second part is a new and original story. In Kingsman: The Secret Service, Harry runs a recruiting program for a group called “Kingsman.” The Kingsman is a secret spy service in England that defends the world from various threats. Determined to make it a suitable member of the organization, Harry will take care to train Eggsy not only as a killing machine and mincing but also one of the finest gentlemen Empire of Her Britannic Majesty ever given to the world. Incidentally, a task which will not be easy for him because a madman and genius billionaire called Valentine (Samuel L. Jackson) intends to unleash its global solution on the planet. Can they turn Harry and his pupil plans evil super-criminal? In Kingsman: The Golden Circle, Eggsy is a spy and an agent. But not everything is not okay for Eggsy because now the Kingsman are threatened by an unknown force. 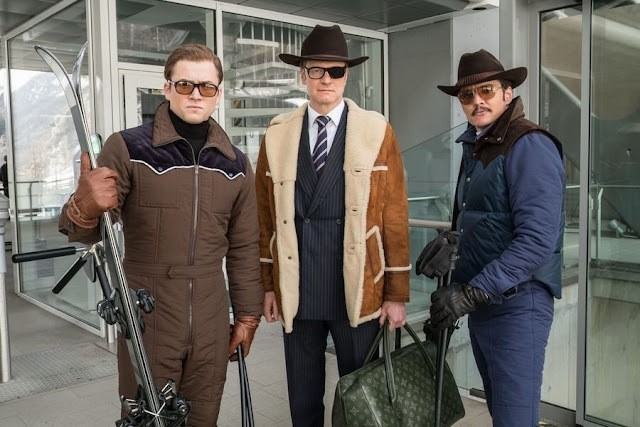 When their center of operations is attacked, the Kingsman must ally themselves with extravagant American spies to defeat whoever terrifies the world. In a new event that will test the power of the agents to the limit, these two elite secret establishments unite to defeat a common enemy to save the world, something that has become a practice for Eggsy. Kingsman is based on a novel, it was slightly different, as the spy and his godsons were uncle and nephew. The first called himself Jack London, and also came from the slums of London. Pitying her little sister and the eldest son of this one, he decides to take the kid from the streets and try to make him a spy, including an accelerated manner, seduction, and martial training course. From there, the story is quite broadly similar to the film, although with some distinct differences. Kingsman asks little of you, urging you to sit down and enjoy the ride. You can see right into the gimmick of putting big names on a poster to get you to buy a ticket—indeed, the American characters mostly recede after short appearances. The gadgets are so excessive that no one feels really in danger, eliminating any actual intellectual or emotional backing in the film. But what it does it does well, revolving around a laugh-out-loud performance by Julianne Moore and enough action to keep you interested. And by some odd circumstance, if you find yourself sad if an important character gets blown to smithereens, I would not worry too much about it. This is Hollywood, and this is Kingsman. I am sure a particle-rejoinder-machine will be invented just in time for the sequel. Kingsman: The Golden Circle will hit theaters in India on 22nd September. Matthew Vaughn returns as director of this unusual spy story. Beside him, Colin Firth and Taron Egerton will play the leading roles in this sequel. But also have other category names such as Mark Strong, Halle Berry, Julianne Moore, Jeff Bridges and Channing Tatum in the most prominent supporting roles.